With six categorised climbs crammed into a short but stinging 97km route, today's stage profile looked like an upturned saw. For me, and probably half the bunch, today was a last chance to get up the road and try to win a stage here. But there were plenty of other races going on within the race too. Eighteen points separated the top four in the mountains competition this morning and with a maximum of 53 points on offer on today's climbs, Belgian Thomas de Gendt needed to score a few to hold onto his polka-dot jersey. 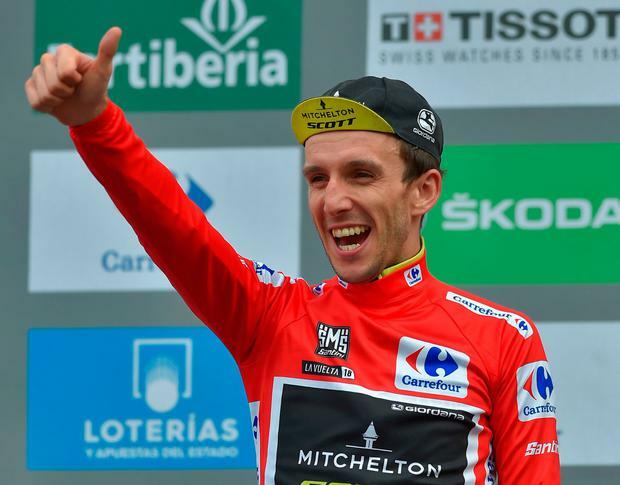 Race leader Simon Yates of Mitchelton-Scott held a 1'38" lead over Movistar's Alejandro Valverde but with just 33 seconds separating the Spaniard from fifth-placed Miguel Angel Lopez of Astana, today was also the last day for any of the top five to improve, or even possibly win this Vuelta. All of this meant it would be very difficult for any escape group to hold out to the finish, but I still got to the start 10 minutes early so that I could be near the front when we rolled out and the inevitable attacks came. Tao Geoghegan Harte of Sky went clear on the opening incline but, instead of counter-attacks behind, De Gendt's teammate set a pace so hard that only a dozen of us held on as he crested the top first with mountains rival Bauke Mollema taking second. On the descent our breakaway group swelled to 15, but only had a 1'30" lead starting the 7km long first category Coll de Beixalis after 13km. When Mollema attacked the break at the bottom in the hope of dropping De Gendt, I knew we hadn't much chance of staying away, especially when De Gendt went past him, spurring a chase from Mollema and three others and leaving 10 of us trailing behind in no-man's land. I led the chase on the descent before the climbers dragged us back to the front 15km later, halfway up the 10km long Coll de Ordino, where after 36km we were told that Astana had lit up the chase behind and our lead had dropped from 2'30" to 1'30". For some reason, with 50km to go, Jesus Herrada attacked us on his own but we reeled him in on the long descent heading towards our second time up Coll de Beixalis after 57km. By then, we only had 45 seconds as Michal Kwiatkowski rode on the front with his teammate De la Cruz, Rafal Majka and Mollema in his slipstream. I was on Mollema's wheel when the pace suddenly increased and looked up to see the front four pulling clear in the slipstream of the TV motorbike. Nelson Oliveira and I shouted and gestured for it to move off, while Dario Cataldo and Omar Fraile sat up to help their Astana teammate Miguel Angel Lopez, who had attacked the peloton and was on his way across. Most cyclists have used mopeds for motor-paced training at some stage and know how much faster you can ride in the slipstream of one. This Vuelta has been the worst race for TV motorbikes riding too close and affecting the race. We've all complained but they just don't care. Maybe we should put different jerseys on the cameramen, connect them to our team radios and just have a drag race behind them. Afterwards, TV pictures showed race leader Yates arguing with the other TV motorbike as they helped Astana drag the peloton up to us on the climb and all Oliveira and I could do was look at each other and shake our heads as Lopez and co. flew past. We hung in with the Yates group for a while before easing up near the top. Various groups caught us on the way to the finish, where I crossed the line, nine minutes behind stage winner Thibault Pinot of FDJ, put a jacket on and rode 16km back down the climb, to the team bus for another three-hour transfer to our next hotel. After arriving very late to our hotel last night, the teams staying there were greeted with a big bowl of plain white pasta for dinner and a yoghurt for desert. Thankfully, our team chef rustled up some burgers instead, but after three weeks of looking at pasta, other teams just stood up and walked out. For some reason, it's become fashionable to start the last stage of a Grand Tour late in the evening, although none of us riders like the idea. Ironically, a late start usually means a long early morning transfer and we had another four-hour trip today, this time by car and train. Race-wise, late starts mean the low evening sun makes things dangerous and in previous editions we've literally been racing blind into corners with the glare. Apart from the sprinters, not many riders had a vested interest in today's stage and to be honest for most it was just about ticking off the kilometres until we could get changed and go home - or at least to our next hotel, as the late finish also meant nobody could get home afterwards and we had to stay here another night. I tried to give our sprinter Fran Ventoso a hand to get into position in the last 5km today but we got swamped by the big sprint trains as Viviani took stage honours with Yates taking a fine overall victory. Not having raced for three months prior to this Vuelta made things tough but hopefully these three weeks will give me some good legs for the end of season races now and help set me up for next year. Tonight, Fran has organised a farewell dinner for the team and tomorrow I fly to southern Spain for a few days training ahead of the world championships. After that, I have a get-together with my new Sunweb team, before flying to London for my agent's wedding and then off to the Tour of Turkey..